ABP 2011 opened Friday, July 29th at Rooftop Films with live music from Lips, followed by a screening of international premieres and student exclusives. Screening was followed by an after party at Matchless, located at 557 Manhattan Ave in Brooklyn. On Saturday, July 30th - ABP held its first animation trade show, art gallery exhibition and filmmaker brunch at BAMcinématek. ABP 2011 at BAM featured five individual programs. A special Animation for Kids Program screened on Saturday and Sunday. Program One featured experimental works and music videos, while Program Two showcased professional narrative shorts. ABP Saturday after party was at the Fourth Avenue Pub, 76 4th Avenue, Brooklyn. On Sunday, July 31st - Program Three featured award winning independent shorts, studio animation and fan friendly shorts, while Program Four mixed global films with NYC premieres. The closing evening after party was at Habana Outpost at 757 Fulton Street, Brooklyn. ABP 2011 opens on Friday, July 29th at Rooftop Films, located at the Automotive High School - 50 Bedford Avenue, North 13th Street, Williamsburg, Brooklyn NY 11222. The evening will feature live music, followed by an outdoor simulcast screening on both lawns at Automotive High, featuring international cartoons, world premieres and fan friendly shorts. Doors to ABP @ Rooftop Films on July 29th will open at 8pm for live- music and the ABP screenings will start around 9pm. There will be a short ten-minute intermission after Xxcuzxme. Animation Block Party continues on Saturday, July 30th at BAMcinématek located at the Peter Sharp Building, 30 Lafayette Avenue in Brooklyn, NY 11217. 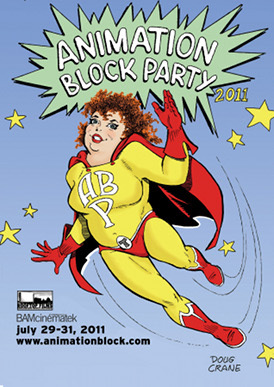 On Saturday, July 30, 2011 - ABP will hold its first ever animation trade show and art gallery exhibition at BAMcinématek from 12pm-8pm. Trade show attendees will include Animation Mentor, NY Bike Jumble, L-Magazine, DaVinci Artist Supply, Green Mountain Energy, The Community Bookstore and many more. The ABP gallery exhibition will feature content from animation talents such as Doug Crane, Howard Beckerman, Deborah Ross, Maori Stanton, Jeff Scher, Mike Lapinski, Caroline Foley, Michael Langan and London Squared alongside festival photos from Jazzmine Beaulieu. The Saturday ABP trade show and art gallery is free and open to the public. Movie tickets must be purchased separately. Saturday, July 30th at BAMcinématek features three different animation programs. A special screening at noon will feature Animation for Kids (also showing 12pm on Sunday). Program One will feature experimental animation, fresh music videos and subversive design works. Program Two will showcase exceptional student films and professional shorts. The Saturday night after party will start around 10pm at the Fourth Avenue Pub located at 76 4th Avenue in Brooklyn. The party will feature free beer with proof of ABP-BAM ticket purchase. Please trade your ticket for a wristband when leaving movie-theater. Animation Block Party closes on Sunday, July 31st at BAMcinématek, 30 Lafayette Avenue, Brooklyn. Program Three will feature award winning independent shorts, studio animation and other standout works. Program Four will mix global films with New York premieres and local animations. 2011 ABP festival prize jury is Emily Carmichael, Mike Hollingsworth, Lisa Crafts and Max Winston. Prizes include software from Toon Boom, DigiCel FlipBook, Dragon Stop Motion, Script Pipeline, designer bags from Crumpler, DVDs, a production grant and Boinx iStopMotion Pro for Best Student Film. Festival honors will be announced at www.animationblock.com the day after the festival. To vote for ABP 2011 Audience Award, please tweet your favorite film title to hashtag #ABP or reply to @animationblock on Twitter OR email your title of choice to abp2011@animationblock.com.